We feel very proud to have created a beautiful building for the YWT Stirley Community Farm project that will be enjoyed by the local community for many years to come. 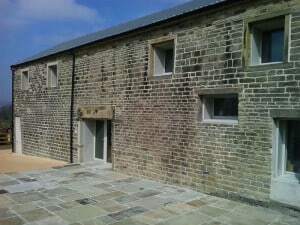 The feedback so far has all been very positive and Yorkshire Wildlife Trust are also rightly proud of the building. YWT have been great clients and have shown real vision in embracing the Passivhaus approach to low energy building by going for EnerPHit certification with the project. It’s been a true team effort and as always it is our Green Building Company Site Manager, Jude Wilson, and the on site team that have made it happen and have done a fantastic job, in often very difficult weather conditions. We also owe a lot to Brian Lavelle the YWT manager at Stirley Farm who has now moved away but who stuck with us and the project. Thanks to the team at Leeds Beckett University’s Centre for Built Environment we had the final airtightness test for the project in December and were delighted to get a final airtightness reading of 0.31 air changes per hour @50Pa. This was a tremendous result, especially given that the EnerPHit certification only requires 1 and Passivhaus requires 0.6. And so it should be, as our ‘box within a box’ design meant that we had a lot of control over airtightness barriers. We were a bit disappointed that the airtightness test was very slightly worse that the first fix airtightness test. We’re still not completely sure why this was. 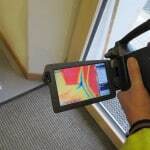 The Leeds Beckett team also brought their thermographic camera, which was identified the need for adjustments needed on the doors, which might have gone out of adjustment since the first test. The first airtightness test was also done before all services (MVHR, electrics, & plumbing) were added. Although we are always careful to consider airtightness when installing services, we didn’t always have control over or communication with some sub-contractors. It is possible they may have drilled through the airtightness barrier in the timber frame without appreciating the possible effect of this. This can sometimes be a problem with Passivhaus projects and demonstrates the need to be continuously on our guard and give appropriate guidance to subcontractors. We hope it serves as a useful cautionary tale for others! But, these minor issues aside, it is still an awesome airtightness result of which we are suitably proud! We set out to make the heating system as simple as possible but it is only now that we have got to the bottom of a problem – over heating. The Barn has been occupied for 6 months and it has taken this long to realise the controls are being erratic. We are finding that, with PH buildings, setting the heating controls to perform properly potentially takes an extraordinary long time, because the thermal mass makes the building act like a cave, meaning that every change in temperature takes so long to make judgements. This was so on the Denby Dale project, where it took us a heating season and a half to fathom. After our experience at Denby Dale we were determined to simplify the heating system at the Stirley Farm project. We installed a Vailant combi boiler, over-sized radiators (so the return temperature was low enough not to cause the boiler to ‘cycle’ on and off making it less efficient) and one programmable room thermostat in the main room. Simple. No. Unfortunately the smaller meeting room, which is being used temporarily as an office, has been overheating sometimes and it has taken us a while to work out what is going on. We now think we know why. The one slight bit of sophistication we used in this system is a remote programmer/room stat. It now appears that, because there are two internet routers positioned next directly next to the boiler, we are having intermediate interference with the heating controls. Hopefully this is something we can now rectify! We are in the process of finalising all the data for the EnerPHit certification which will hopefully be happening in spring 2014. 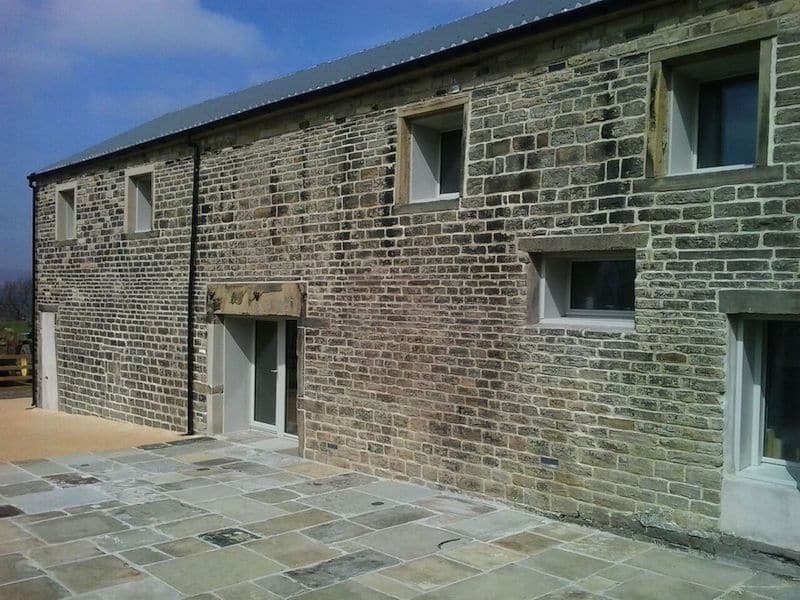 Our final blog will include all the final certification data for the project. .
Of the two Passivhaus projects we have undertaken to date, our retrofit Stirley Farm project has definitely been harder than our newbuild Denby Dale Passivhaus project. Structural issues such as the foundations, the condition of the existing masonry, needing to strengthen the walls all made it harder. In theory, timber panelling should have been easy, if we hadn’t had to work around the existing window/ door openings and roof trusses etc. Once we’d got to the inside the kitting out was easy. It was the fiddliness of dealing with an existing building that made it tricky. Despite the challenges, we are delighted with the end result and hope that it will serve as a useful template for similar projects working towards EnerPHit level thermal performance. The ‘box within a box’ approach we implemented at the Cre8 Barn could potentially be a useful template for historic buildings, where preservation of the exterior appearance is very important.. My co-Director Chris Herring will be sharing our experiences and speaking on the project briefly at the International Passivhaus Conference in Aachen this April. We also hope it will help raise awareness of Passivhaus low energy building to all the many Yorkshire Wildlife Trust visitors to the Cre8 barn. 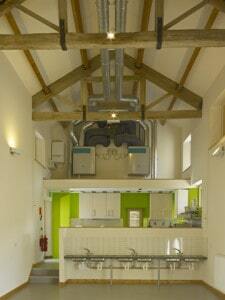 The building will be in use constantly throughout 2014, with various open days and educational visits planned. Fantastic result! Curious issue with the router interference though.